Love all the instapots at the potluck! That is simply hilarious! Thanks for your take on community. My husband, 2 year old, and I will be hitting the road in about 18 months and that is one thing we’ve been worried about. We have however met another stationary RVer that will be hitting the road soon and I also just attended the RV Entrepreneur Summit, so already creating a community. 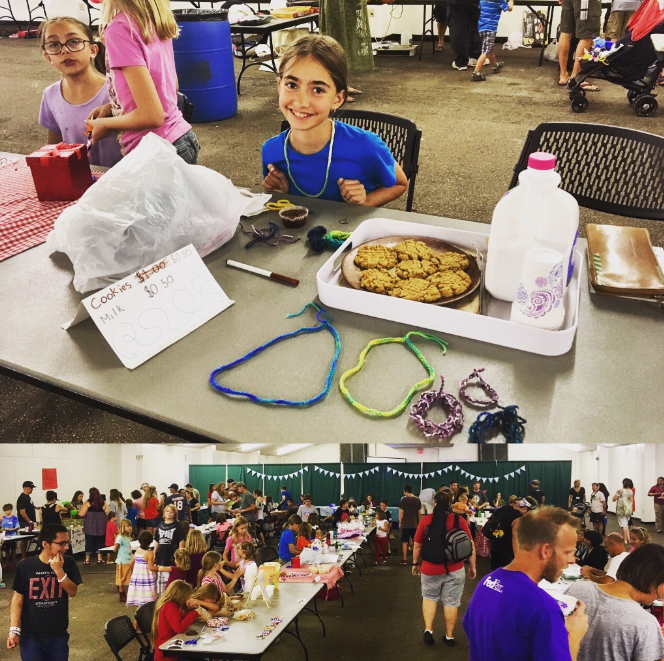 Here’s a recap of my VERY first meet-up with another RVer! 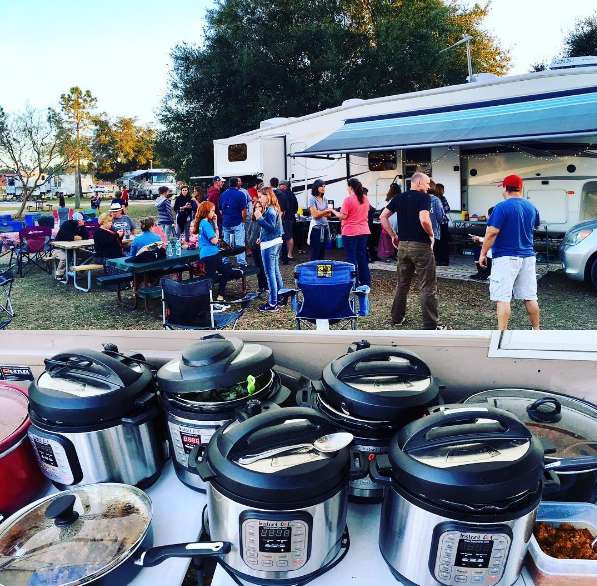 The community of Instant Pots was irresistible to me as well–I had to take a picture! Thanks for sharing the link to your post. I really enjoyed it and loved that I’ve actually connected to the person you met up with as well (although not in person–yet anyway)! 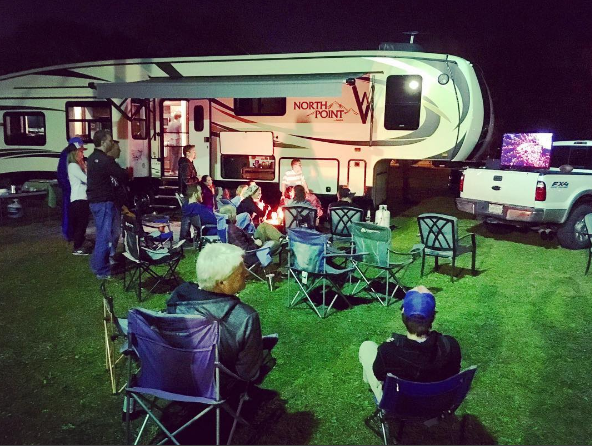 I’d not heard about the RV Entrepreneur Summit and enjoyed your posts about that. Awesome post! I couldn’t agree with you more, we were on the road 6 months before the Rally, and community was missing, and now I feel like it’s out there more and more every time we make new connections! Wasn’t the Rally a lovely way to really see how “not alone” you are on the road? I loved that! I understand your perspective of finding a deeper connection than just the niceties we often exchange. As a single semi-retired gal, I’m preparing to travel the country with hopes of finding a strong sense of camaraderie by sharing His love through acts of kindness and helpfulness in any way I can. It will be interesting to see where the road will lead me. I believe that like minded people attract the same and am excited to find this kind of community as I travel. Great post! I love how this lifestyle can lead us to be more intentional in relationships. It was our #1 reason for becoming mobile. There’s another aspect to this, too. For us, we had friends and family all over the country who don’t or can’t travel. In the “normal” life, people have to wait for their 2 week vacation time, save up for plane tickets or gas, and cram as much into that time as possible. We knew we wouldn’t see enough of the people we love that way. So we got mobile. Now we go to them! Plus, when you’re a visitor people tend to create an uninterrupted margin of time to be with you. I get more quality time with my closest friends now than I ever did when we lived in the same town and went to the same church & coop. The time is special. Anyways, thanks for the post! Glad others are looking at this relationally like we are. Enjoy your journey! “When you’re a visitor people tend to create an uninterrupted margin of time to be with you” YES that is so, so true and I love that aspect as well! This post is so encouraging! We haven’t had the opportunity to meet any other fulltime families since we began last September, and definitely are feeling isolated. Due to a death in our family, we have been back home for the past few months, but are now gearing up to head back out. My hope and prayer is to meet others like us and be a part of the wonderful community of full-time families out on the road. Oh Sarah, first of all I am so sorry for your recent loss. I hope you have been able to find good support in this time of grieving! Secondly, I hope and pray for you that community is just around the corner! Where are you now and where are you headed this year? Being on the road 5 months, our family experienced the unique community that comes with being nomadic just as you described. Yes, it takes extra effort, but that pays off! Relationships are distant but yet more intense; different backgrounds, cultures, and beliefs broaden and enrich our life views; and all benefit from the historical and natural settings. Thank you for your detailed review on this aspect! I enjoyed your thoughtful writing. However, another aspect of this nomadic lifestyle is also an intense loneliness and constant feeling of transience, despite rich community that can also exist. For our children in particular, they enjoyed the travel opportunities, museums, sightseeing, and new friends, but there was simultaneously a complicated emotional experience that I would not describe as positive. We have a very low-tech lifestyle (no iPads, iPhones, etc), and thus our children rely solely on family and friend relationships and real life experiences. 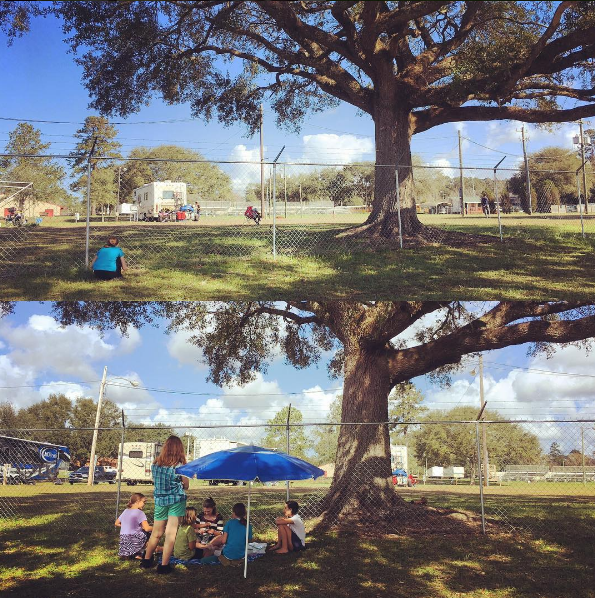 As time progressed, it became obvious they still desperately needed roots, a place to belong, a home that was not constantly changing and moving. My husband and I tried to excuse and reason away this reality, because we thoroughly enjoy being transient now. But we were forced to reflect upon our stable childhoods – the smells, sights, and feel of home from which we greatly benefitted. Home is so much more than emotions, people, or location; yet somehow, this “home” is created by all the senses and experiences, and does tie itself to location, people, and emotions. Reading many travelers’ blogs, the positive aspects of this lifestyle are generously covered. However, a brutal honesty about the effects upon children and then second order effects upon the parents might have helped me better prepare for the nomadic lifestyle. There are always pros and cons to every choice in life. Seeing both helps all create a realistic picture. Doesn’t it seem like in all walks of life there are the stabilizers and the explorers? I think this has been our general conclusion – that we personally may be better suited to being stabilizers (or builders) of a society, rather than the explorers. Perhaps this reflection of ours might help those considering the nomadic explorer lifestyle in evaluating their own selves (and families) as to who they really are and what lifestyle might better work for them. I absolutely think your response is important and necessary. I am glad you shared your insight. 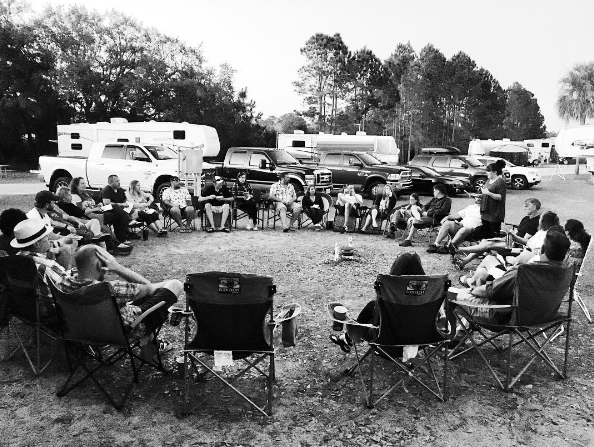 I think that most of the people we’ve met have been RVing for a long time which means they fall into the “explorers” category and if they are still traveling after __# of years, they have found ways to make it work for them. Who we are less likely to run into on the road are the ones who tried this lifestyle and found it to not work for them simply because they are not on the road very long. I remember reading a post that the Newschool Nomads wrote when they decided to back down from full-time travel because of their kids (that post can be found here http://www.newschoolnomads.com/2016/04/29/family-stopped-full-time-rving/). It was helpful to read their perspective and gain insight into why a family may want to stop after being on the road for a long time as they had. I also personally found it interesting to read her follow up post after they started traveling as I think it gives perspective on what it is like for an “explorer” to be held in one place after they’ve been able to really be on the go http://www.newschoolnomads.com/2017/02/09/really-like-family-stop-full-time-rving/. I imagine this perspective would be a lot different for a “stabilizer”. I also think it would be interesting to follow families that set out to full-time and check in with them at 3, 6, 9 and 12 month intervals. 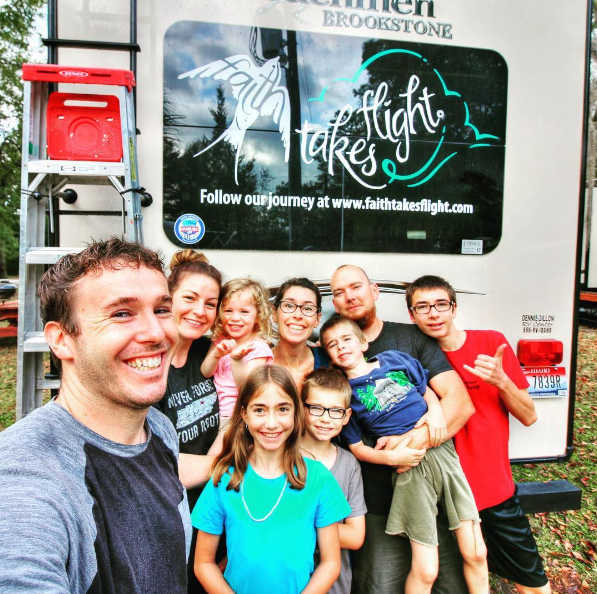 We listened to a lot of podcast interviews before hitting the road on the Family Adventure Podcast show with families who said that they wanted to be done around the 3-6 month mark of travel but found later they felt different after they had time to work through the issues that caused discomfort. This is not to say that everyone would want to stay on the road who is not loving it, but just to say that it is interesting to see how our thoughts on it can change over time as our situation and especially the community we fall into grows or changes. Thanks for opening up the discussion. Let me know if you have any further thoughts!